Giddy Yap! Another great way to see Mammoth Country is by horseback. 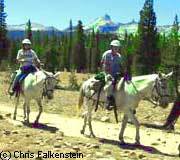 Pack Stations offer hour-long, half- and full-day rides as well as week-long excursions into the Ansel Adams and John Muir wildernesses. Some of the Packers also do cattle and horse drives, usually in the beginning and end of the season. 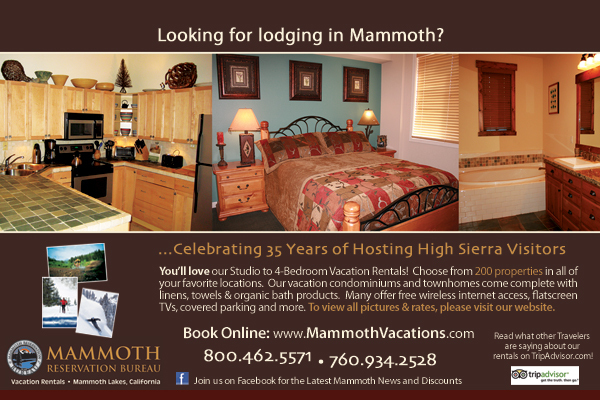 Mammoth Lakes Basin is a very popular ride passing by a historic gold mine and mining camp. Other favorites include the Mammoth Rock trail and guided rides along Convict Lake, McGee Canyon and Red's Meadow. Relax and enjoy the Sierra scenery while the horses do what they love. Head out into the backcountry for a true wilderness experience you will never forget. Experienced and amateur riders alike will enjoy this outdoor activity Don't miss the thrill of western life! Pack Stations in nearly every major canyon of the Eastern Sierra offer hour-long horsebacks rides, half-day and all-day excursions, and custom multi-day or week-long pack trips. An experienced guide can show you the real mountains of the West. Full-service trips complete with camp and cooking needs are also available. Pack outfits are located in Independence, Big Pine, Bishop, Mammoth, June Lake, and Bridgeport and we have them divided by geographic zone of where you would like to ride. You will need to book longer trips in advance and call the various pack station outfitters to find out their specific rides and costs.